1.7 What is the relevance of GIS? One of the first applications of spatial analysis occurred in 1832. The French geographer Charles Picquet represented the 48 districts of the city of Paris by halftone color gradient according to the percentage of deaths by cholera per 1,000 inhabitants. In 1854 John Snow graphed a cholera outbreak in London using points to represent the locations of some individual cases, possibly the earliest use of a geographic methodology in epidemiology. E. W. Gilbert's version (1958) of John Snow's 1855 map of the Soho cholera outbreak showing the clusters of cholera cases in the London epidemic of 1854. In Ottawa, 1960, the federal Department of Forestry and Rural Development created the world's first true operational GIS. Developed by Dr. Roger Tomlinson, it was called the Canada Geographic Information System (CGIS) and was used to store, analyze, and manipulate data collected for the Canada Land Inventory – in order to determine the land capability for rural Canada by mapping information about soils, agriculture, recreation, wildlife, waterfowl, and forestry allowing analysis of this data. The CGIS improved over "computer mapping" applications as it provided capabilities for overlay, measurement, and digitizing/scanning, supporting of federal and provincial resource planning and management. Its strength was continent-wide analysis of complex datasets. The CGIS was never available commercially. By the early 1980s, some enterprises [including, Environmental Systems Research Institute (ESRI), the owner of GIS] emerged as commercial vendors of GIS software, successfully incorporating many of the CGIS features, combining the first generation approach to separation of spatial and attribute information with a second generation approach to organizing attribute data into database structures. Government - to improve law enforcement, health, military defense, transportation, emergency medical service, manage disaster, etc. Business - sector such as banking, insurance, logistic, etc. Education and science - to provide data for research, in library and museums, etc. Environment and conservation - to collect data about water, oceans, land, wildlife, etc. Natural resources - in the same way to improve policies for agriculture, forestry, petroleum, etc. Biography: creating a map of places lived by an author, with meta-data listing works published while at each location. Latitude - a position between the North and South poles. Often recorded in degrees, minutes, and seconds (i.e. the Arctic Circle is at 66° 33′ 39″ N) or decimal ( 66.5622° N). The equator is 0°, the poles are 90° (N or S). 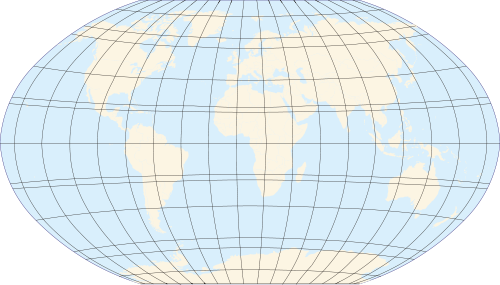 Longitude - a position (angular) of a meridian relative to the Prime/Greenwich meridian. Elevation - a position above or below a reference point, typically the earth's sea level. Measuring distance between two points - note that the surface length of a degree of latitude changes mildly depending on originating latitude (1° = 110.574 km to 111.694 km). However, the length of a degree of longitude changes markedly depending on originating latitude (1° = 0 km to 111.320 km). Projection - is the method used in translating 3D space into a 2D display. Datum - a reference datum is a set of reference points on the Earth's surface against which position measurements are made. A specific point on the earth's surface can different co-ordinates depending on the datum used in its collection. NAD83 and WGS84 are common Datum. Geotagging - adding geographical identification data to any media. Geocoding - finding geographic coordinates associated with a location or space. combining shapefiles can increase visualisation/modelling potential. For e.g. adding a population density layer, an elevation layer, a waterways layer. Analysis - the process of modeling, examining, and interpreting model results of spatial data. The GIS package offer tools that plays a particular task in order to create a complete system for designing and managing solutions through the application of geographic knowledge. For instance - ArcView [it is able to view and edit GIS data held in a flat file database or through ArcSDE] uses a relational database management system for spatial data; ArcEditor [designed for advanced editing of spatial data], ArcMap [used to view, edit, create and analyze geospatial data] it can create and manipulate data sets to include a variety of information. Just to talk about some of those tools that compound this powerful software. What is the relevance of GIS? Hurricanes' and Cyclones' trail using GIS. With GIS technology is possible to link location to information that applies to many aspects of decision making in business and community. Decisions such as choose a site, target a marketing segment, planning a distribution network, zoning a neighborhood, allocate resources, and responde to emergencies. All these problems involves locations’ questions such as what areas are most vulnerable to hurricanes, for example. Or where are current and potential customers? Or Where should we locate a new elementary school? etc.. And the GIS helps to answer such questions combining data from governments and other sources in a custom map. GIS works representing features on the Earth (buildings, cities, roads, rivers, etc.) on a computer. It is used to understand data about the world and human activity. Generally this data is displayed on a map, which provides an advantage over using of database. It is interesting because maps and spatial analysis can reveal patterns and show connections that cannot be clear in tables or texts. It can be an interesting feature to think how GIS can change and improve researches aspects, for example. In short - This tool link geographic information (WHERE) with descriptive information (WHAT). The purpose of this example is to introduce a few basic elements of GIS. It will involve creating a map of (some) places that Charles Dickens lived. Note: Google doesn't use N/S or E/W designations in it's co-ordinate system. For latitude, south is negative, north positive. For longitude, west is negative, east positive (relative to the Prime Meridian). Note: Some streets and addresses may have changed since Dickens' lifetime and may be difficult or impossible to locate now. Once coordinates have been gathered, they can be imported into a mapping tool. In this case Google Maps. While logged in to a Google account, select My Maps and then Import. Here is a sample GeoRSS file to import into Google Maps, which shows the structure of same basic elements: line and point. A similar file should be created using the coordinate points found in this exercise. Note: Other GIS applications will accept tables of data in Excel or CSV format, or other formats. Once the GeoRSS file with the coordinate points has been imported, it is displayed as a layer within Google Maps. Karen Kemp, "What can GIS offer history?" International Journal of Humanities and Arts Computing. Volume 3, Page 15-19 DOI 10.3366/ijhac.2009.0006, ISSN 1753-8548, Available Online Oct 2009 . Akihiro Tsukamoto, "Unfolding the landscape drawing method of Rakuchū Rakugai Zu screen paintings in a GIS environment." International Journal of Humanities & Arts Computing *. Volume 3, Page 39-60 DOI 10.3366/ijhac.2009.0008, ISSN 1753-8548, Available Online Oct 2009. Ian N. Gregory and David Cooper, "Thomas Gray, Samuel Taylor Coleridge and geographical information systems: A literary GIS of two Lake District tours" International Journal of Humanities and Arts Computing. Volume 3, Page 61-84 DOI 10.3366/ijhac.2009.0009, ISSN 1753-8548, Available Online Oct 2009. Lionel Rothkrug, "Religious Practices and Collective Perceptions: Hidden Homologia in the Renaissance and Reformation" (Historical Reflections/Reflexions Historiques, vii, Waterloo, 1980). This page was last modified on 16 January 2013, at 12:38. This page has been accessed 16,602 times.